Making assisted suicide more accessible?! A non-disabled friend of mine expressed suprise that not only was I unwilling to help him ensure that assisted suicide would be made fully accessible to disabled people, but that I was also very much against the idea of assisted suicide being made legal in the first place! Recently retired from a life in the medical profession, John is now serving in a voluntary capacity on a panel set up to address the issue of making assisted suicide legal. 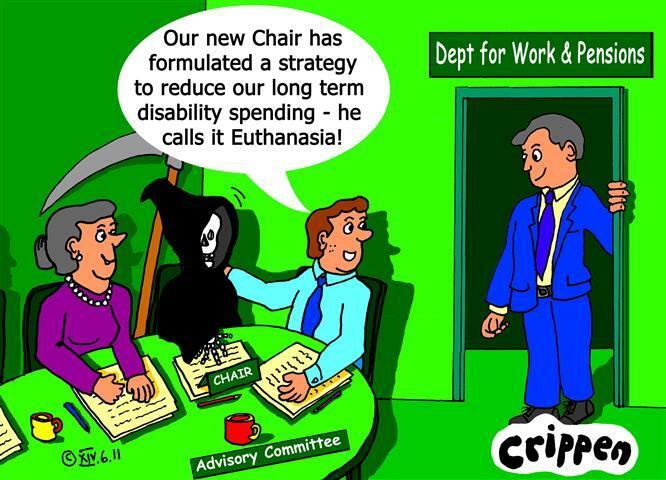 In his - in other areas commendable - awareness of disability equality he wanted to make sure that assisted suicide would be equally accessible to disabled people and he wondered if I would be able to help him think through some of the associated issues. It became clear as I started to explain my position on this subject, that he hadn't considered there would be people vehemently opposed to the whole concept of helping someone commit suicide. His rational medical mind had seen it purely as a way of helping people who were too ill to continue living, and who had made a decision when they'd been able to do so, to obtain assistance to end their life in a dignified and peaceful manner. Part of his argument was that it was something that was already happening; doctors and other medical staff assisting a patient to end there life by witholding treatment or by increasing the dosage of pain killers. Making it legal would mean that there would be controls put into place and that medical professionals wouldn't be able to randomly end someone's life as they saw fit. 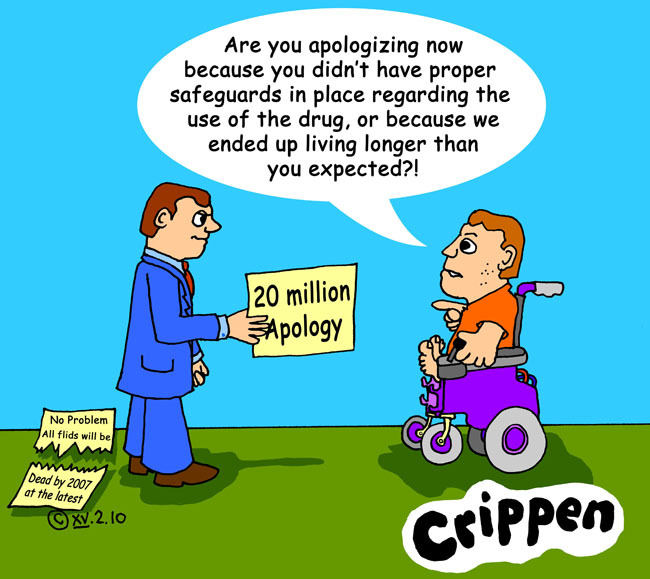 I started to explain that disabled people in particular were adamantly opposed to assisted suicide becoming legal because this would inevitably mean that a medical professional would have the power of life or death over a disabled patient, and that it would inevitably lead to pressure - however subtle - being put on people who felt that they were becoming a "burden". He replied that this was exactly why legislation was needed. If there was a legal framework around such medical intervention, Jane would have had to have been consulted before any discussion about this took place. I pointed out to him that current legislation already protected Jane's rights in this way and that by making assisted suicide legal this could undermine those rights. My medical friend - a good, thoughtful and thorough man - was none the less unaware of the groups of disabled people who were campaigning against legislation or of the arguments that we are putting forward against it. From listening to him it seemed that the panel had proceeded with the assumption that making assisted suicide legal was not only a positive thing but was also in the best interests of everybody. I think he was suprised to learn that there were so many people against the idea, despite the recent 'End of Life Assistance (Scotland) Bill' by Margo Macdonald suffering an overwhelming defeat by a 85-16 margin last November because MSPs were convinced that its ‘safeguards’ were not safe. I concluded our discussion by suggesting that perhaps people would not see assisted suicide as the only option if support services for people at all stages of their lives (and death) were adequate and appropriate. I've offered to give my friend some information compiled by disabled people who are against legislation being passed and to provide him with the contact details of those people who would be prepared to discuss the issues with him. If you have something to say on the subject, please leave your comment in the following section and I'll make sure that it is forwarded. Thanks. There are currently several other sites covering this subject. Here are the links for a few of these. We're MAD and we're angry! On Tuesday 26th October 2010 at Speakers Corner, Hyde Park at 1300 hours, the campaigning group MAD PRIDE have organised a day of action to oppose welfare benefits cuts for people labelled Mentally Ill.
UK mental health service users and survivors will publicly assemble to re-enact the opening chapter of Michel Foucault´s seminal book ‘Discipline and Punishment’. A life-size effigy of a prominent Conservative/ Liberal Democrat merger politician will be publicly executed by method of hanging, drawing and quartering, after which the remains of the body will be burnt. There will also be a variety of other visual and subliminal stunts on the day. Speaking to one of the organisers of the demonstration, she told me that “the economic downturn caused by the irresponsibility of bankers and big business has led to the Coalition government to enact the biggest cuts in public services since the Second World War. “Further, that instead of targeting bankers’ bonuses and rich people’s profits, they are hoping to make huge savings by attacking the welfare benefits of vulnerable people unable to work, including people with severe mental health problems. As we are now aware, in George Osborne’s recent emergency budget he has pledged to take 360,000 people off of Disability Living Allowance by 2013 – which will plunge over a third of a million vulnerable people, most of whom will have mental health problems, into dire poverty. This will put lives at risk. Already, 6000 people are thought to have committed suicide a year in the UK, although the true figure is definitely far higher. The stress caused by the threat of welfare benefits cuts, as well as the impact of the material deprivation that will result, will undoubtedly lead to a huge increase in suicides amongst people with mental health problems – an outcome that members of MAD PRIDE and other survivor support groups wish to prevent through campaigning and giving each other one-to-one support. More cuts to disabled people’s benefits are promised in George Osborne’s upcoming ‘shock and awe’ spending review to take place on Wednesday 20th October. Added to cuts in housing benefits, the VAT rise, and a whole range of other austerity measures, the future looks grim for the poor and those less able to object or protest – whilst the bankers will get to keep their bonuses. “We’re not taking this lying down!” is the united cry from survivor groups across the UK. MAD PRIDE can now also announce that, also on 26th October 2010, there will be a Nationwide 24 hour medication strike. 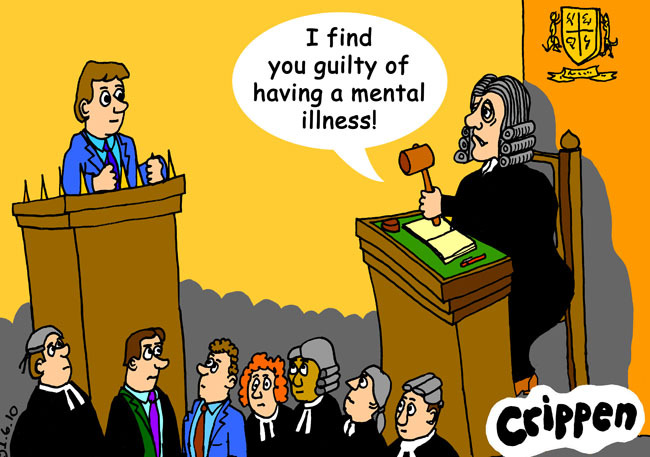 All UK mental health service users will default on their psychiatric medication for one day, in protest against the coming welfare benefits cuts. Further, all UK mental health service users will not engage with any mental health services whatsoever on that day, in a bid to demonstrate the collective power of mental health system users and survivors everywhere. It's not unexpected that people who experience severe mental distress generally find night times the worst time to be alone. This is compounded by mental health trusts not being required to have any more than a tick box quota of staff available at night. In fact, most don't bother providing any real service during this time other than fielding a token Crisis Team often consisting of only two people. I talked to a survivor who attended a recent workshop regarding mental health Crisis Teams. She was told that team workers see themselves as delivering a home treatment service - the teams are in fact called 'Crisis and Home Treatment Teams'. This involves delivering drugs to people at home in order to keep patients out of hospital and to allegedly save money in terms of expensive admissions. Whilst they are out on these so-called 'drug runs' there is usually no-one else available at their base to answer phone calls and respond to requests for assistance. So one would assume that the trusts, needing someone to cover this out-of-hours service, would turn to an experienced private agency or mental health charity in order to check that any phone call, for example, is met with an appropriate response. WRONG! In fact mental health trusts often ask the police to carry out a 'Safe and Well' check on any patient that they are unable to visit themselves. Unfortunately the police have little or no training in mental health issues, and seem to regard this duty as a bit of a nuisance, to put it mildly. 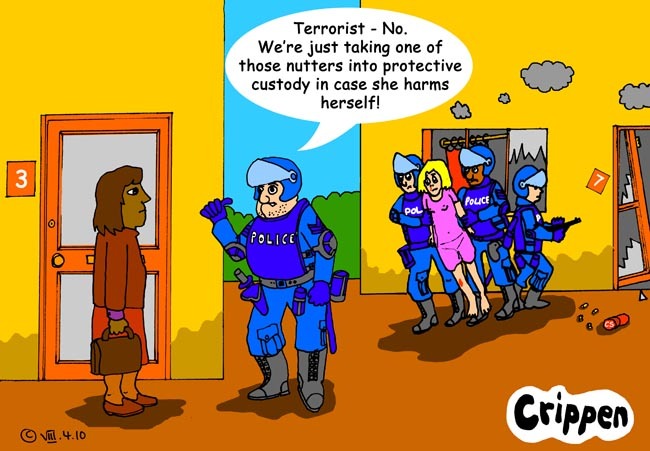 In the experience of our survivor a lot of police officers are extremely prejudiced and will often view anyone presenting with mental distress as a potential axe wielding killer. Forget the loveable village copper image. The description of one such response team fitted more the heavy booted descendants of the notorious Special Patrol Group (SPG). Therefore, if the police go to a house and can't get a response, often because the person is too scared to open the door, they have been known to break it down. Even if they don't have to break their way into a home, they often forcibly drag people out, usually handcuffed (more them once this has happened to our survivor when she's only been wearing a night dress - no slippers even! ), before being taken to a police station to be locked overnight in a cell; this is their definition of a Place of Safety! As you can imagine, for people who are already in an extremely distressed and often confused state it is a terrifying experience to also be treated like a criminal in this way. It was estimated that in 2006 around 250 people killed themselves within 48 hours of being detained in this way. Are we surprised?! Fifty years after the one of the worst disasters in medical history, hundreds of survivors of the thalidomide scandal have finally got an apology from the government and a new £20 million compensation package. Mike O'Brien, minister of health, recently announced a new funding scheme that will help survivors cope with the changing needs of age. He also offered what campaigners said they wanted even more – an apology. "The Government wishes to express its sincere regret and deep sympathy for the injury and suffering endured by all those affected when expectant mothers took the drug thalidomide between 1958 and 1961," he told the House of Commons. "The apology is just as important as the financial settlement," said Guy Tweedy, one of those leading the campaign for a better deal. "The money will help people to buy wheelchairs and adapt their houses and cars for a phase of life they were never expected to see. "They didn't think we would be alive today. They thought we would all be dead by 2007," he added. In 1957, the World Health Organisation had warned the UK that its lack of adequate pharmaceutical regulation was courting disaster. It took the thalidomide disaster to reform the system, bringing in the sort of regulation we have today. The Medicines Act 1968 laid down stringent standards that had to be met for the safety and efficacy of drugs. A team of doctors at Queen Mary, University of London, hopes to encourage "difficult" patients to comply with treatment by paying them for every jab of anti-psychotic drugs that they have. 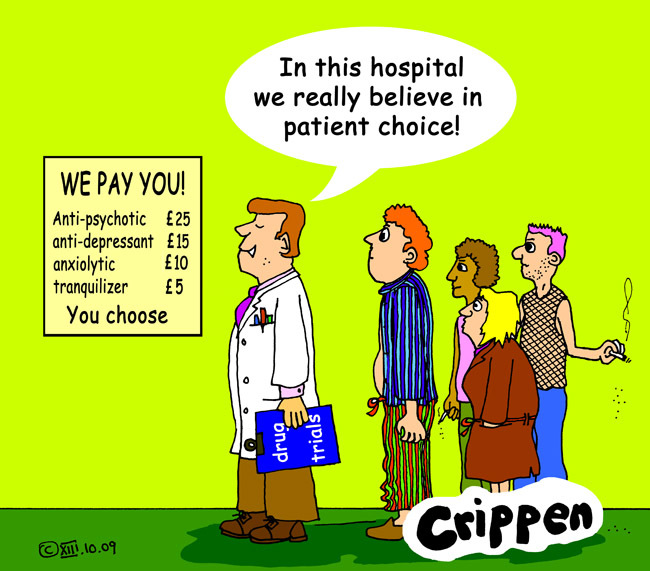 ‘Experts’ believe a third of patients given the label of bipolar or schizophrenia fail to comply with their prescribed medication regime causing relapses and a higher cost to the NHS. They claim that missing as few as one to 10 days of oral anti-psychotic therapy nearly doubles the risk of a patient being admitted to hospital. To avoid this, doctors often prescribe depot treatments - injectible versions of the pills - but this is not fail-safe and patients may simply not turn up for their jabs. Reminder phone calls and texts are also ignored. When all other attempts to achieve adherence have failed, bribery may be an option, according to Professor Stefan Priebe, who led the Queen Mary team. He expects that not only will patients be happy to trade an injection for cash, but that the "money for medication" scheme should pay for itself, with the financial costs more than off-set by the savings made in reduced hospital admissions. But mental health charity Mind said people should be taking medication for the health benefits not for the money. A spokesperson for the charity, Alison Cobb said: "Psychiatric drugs are known to have unpleasant side-effects, and people should take medication because the health benefits outweigh the drawbacks, not because they need the money." Why do I get the feeling that this is all about money and has nothing to do with the welfare of patients? !